Super Hero Boy: We have officially entered the cold/flu season! We have officially entered the cold/flu season! I realized tonight when I went into Connor's room and it was freezing that It's finally time that I need to turn on the heater and with the heat also means its officially that time of year that means colds, sneezing, snot, and ugg (hopefully not this year) flus. I'm not sure why I didn't realize that sooner as the last two weeks we have been a snot haven around here but I always dread turning on the heat as I know its for real. I made a promise to myself that this year we would have a better thermometer. Last flu season we used an old style thermometer and personally I hated it as nothing is worst than trying to hold an angry fussy baby down while you attempt to put a thermometer under their arm. So when we got the chance to test out a Safety 1st ACCU-R.A.T.E thermometer I was incredibly excited. We actually got our first chance to test it about a month ago. Connor's teething has reared its ugly head again and he always runs a fever when we hit rock bottom on the teething chart. The first thing I noticed was its much smaller than I expected. Many of the forehead thermometers I have seen are fairly large but the safety 1st thermometer fits pretty comfortably in the palm of my hand. This makes it pretty easy to disguise it when your attempting to approach a seriously cranky little person who the last thing they want is for you to put something against their forehead. Using the thermometer is pretty simple. All you do is press a button just like you would with a regular thermometer and wait for the beep. Once that happens you hold it against the forehead and wait for a second beep. Really the only complicated thing is making sure its got good enough contact to get a proper reading and keeping the person your taking the temperature of still enough to get a reading. Over the last month I've taken readings on Connor and myself throughout both being sick and being well to try to see if the readings with accurate and though its not nearly as accurate as a rectal thermometer I did notice that the reading was within one degree of the real reading which is more than good enough for me! I should note that the Safety 1st ACCU-R.A.T.E thermometer can be used on the forehead or under the arm though I've found that the forehead is really the easiest place to take a reading. Its really easy to use so much so that dad won't hesitate to use it as well as the grandparents. I would recommend it most for monitoring a temperature or just doing a quick check. If your taking a temperature to report to your doctor I would still recommend taking a traditional temperature but nine times out of ten I end up taking Connor's temperature at least 20 times to each single time I actually report a temperature to his doctor and I'd much rather take 19 forehead readings and save those more invasive readings for when it really needs to happen. 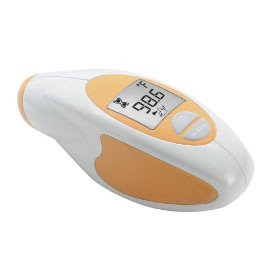 You can get your own Safety 1st ACCU-R.A.T.E thermometer directly off Safety 1st's website!